Monmouth University has contributed in many ways to making our planet greener and more environmentally friendly. We are committed to pursuing green initiatives on campus, and all of us here—from administrators to students—are active participants in this mission. In a collaborative effort, we are constantly developing new ideas and programs to make the University more efficient and less wasteful. Monmouth’s sustainability efforts range from carbon emissions reduction to energy conservation projects, which involve constructing new energy-efficient buildings and retrofitting older ones with new technology. Being “green,” however, doesn’t mean that we wait for the next big project to come along. All across campus, you’ll see that we do the little things that make a big difference, from recycling, to conserving water, to shutting off equipment and lights when not in use. We know that sustainability starts in the classroom. Through academic programs like our minor in global sustainability, we educate students about the importance of forging a greener earth. In addition, through our actions and dialogue, we stress our initiatives to all members of the local and University community. We are pleased to say that we were the first private institution of higher education in New Jersey to enter into a Memorandum of Understanding with the Environmental Protection Agency. As per this document, the University has agreed to lead and participate in activities that promote environmental safety and awareness. Please read more about what we’re doing by clicking the links on the left. 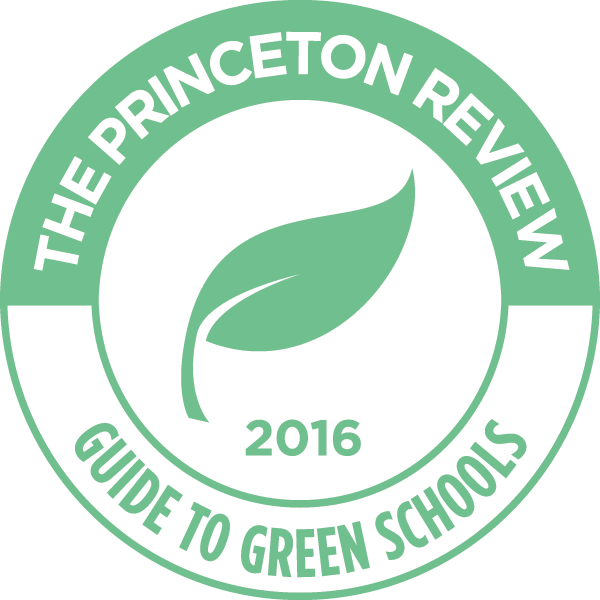 Monmouth University was selected by The Princeton Review as a 2016 Green College.